Dreamweaver’s preferences include a setting that will remind you to add alt text to each image as you add it to a web page. Choose Dreamweaver > Preferences on the Mac or Edit > Preferences on Windows. This will open the Dreamweaver preferences window. 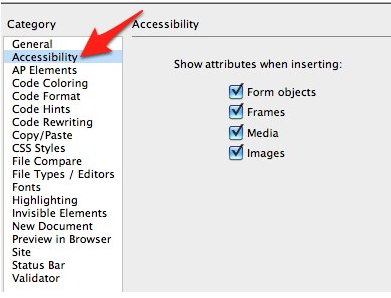 Choose Accessibility on the left side of the preferences window. Check the box next to images on the right side of the preferences window. 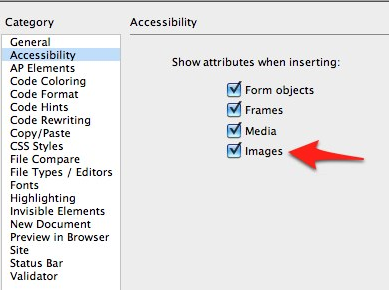 Once you enable this setting, a window will pop up each time you add an image to a Dreamweaver document. This popup window will include a text box where you can add your alt text. For decorative images, click on the pulldown menu to the right of the text box and choose empty. This will add a null alt attribute, which will allow screen readers to skip the decorative image. For more complex images, you can use the Long description text box to link to a more detailed description.